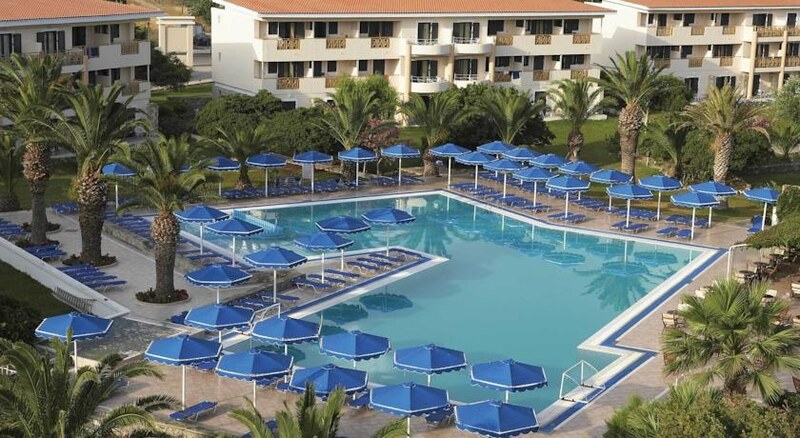 The Mitsis Ramira Beach Hotel is located on the beach of Psalidi just 3.5 km from cosmopolitan Kos Town. A good range of leisure facilities, superb cuisine and 338 beautifully furnished guest rooms and family rooms combine with fabulous facilities and excellent service to make this an ideal holiday hideaway for discerning travellers. Guests to the Mitsis Ramira Beach Hotel can discover marvellous beaches and fishing villages and walk to lots of shops, bars, and restaurants in nearby Kos town. 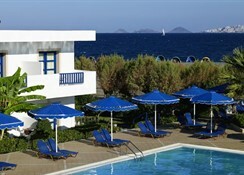 For an outstanding getaway in sunny Kos, the Mitsis Ramira Beach Hotel truly a place where lovely memories can be made! Kos Airport is a 35 km from the hotel. 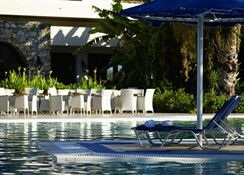 Food, drink and entertainment: All Inclusive accommodation. The hotel boasts a main dining restaurant, Italian and Chinese restaurants plus several other food and beverage outlets scattered around the resort. A multilingual animation team provides an exciting entertainment programme throughout the day & night, with games, musicals, cabarets, sketches, shows, competitions, etc. Once a week, a Greek night is organised with live music and folklore dance! Karaoke nights and piano evenings are also organised once every week. 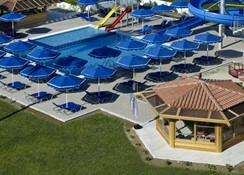 Sports, games and activities: Two outdoor seawater swimming pools, sun beds and umbrellas at the pool and the beach, private peddle beach, amazing water slides for children and adults alike, separate children''s pool, kids and teen mini clubs with a myriad of activities and play areas, sun terraces, sun-loungers, French bowls, gym, tennis, table tennis, darts, pool table, giant water-slide, canoes, pedaloes, windsurfing (experienced guests only), lounge, TV room, Bridge room. Additional: 24-hour reception services (messages, porter), Concierge, currency exchange/credit cards, car rental, visiting doctor (on request, 24 hours), children services: babysitting (at an extra charge and on request), cots, cribs, high chairs, etc, business services: telephone, fax, mail services & photocopy services, hairdresser, guest parking, dry cleaning and laundry, shopping arcade, mini market, gift shop, jewellery, etc., wake-up service, free Wi-Fi Internet in public spaces, High speed Internet access point, florist (extra charge on request), guest parking. The 5 Star Mitsis Ramira Beach Hotel offers a total of 338 carefully appointed guest rooms in the main building or amid the profuse gardens. Room categories are Double/Twin rooms and Superior Family rooms (2 separated sleeping areas), all accommodating up to 4 people. All rooms are decorated in contemporary style, and include individual air conditioning and heating, private bathroom (bathtub/shower, bathroom amenities, hairdryer), direct-dial telephone, mini fridge, Satellite TV, music channel, safe deposit box (with charge) and balcony or terrace with lovely views. Some rooms have Sea view with supplement. Superior rooms have a Mini Bar (water, soft drinks, beer & wine refilled every 2 days, free of charge) and free Wi-Fi Internet access. Breakfast, American Buffet, Main Restaurant, Daily: 06:00 - 11:00. Dinner, Chinese Restaurant, Reservations Required, Daily: 18:30 - 22:30. 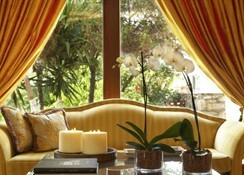 Dinner, Italian Restaurant, Reservations Required, Daily: 18:30 - 22:30. 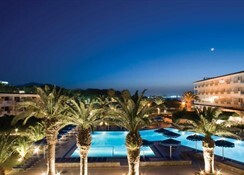 The hotel is situated right on the beach and close to a variety of tavernas, bars and mini markets. 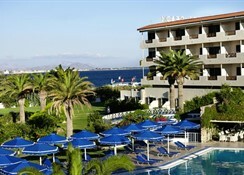 The busy resort of Kos is 3.5km away which is easily reached by local bus. Sophisticated cocktail list daily from 20:00 to 24:00.